Unique 8" ceramic non-stick pan offers non-stick ease, allowing food to slide right out—no oil or butter needed. Versatile metal and ceramic pan is oven-safe up to 500°, allowing for quick stovetop-to-oven cooking. Durable, lightweight aluminum construction delivers rapid, even heating. Scratch-resistant surface can be used with metal utensils. Suitable for all cooktops including induction. PFOA- and PTFE-free. Dishwasher safe. It is as described. 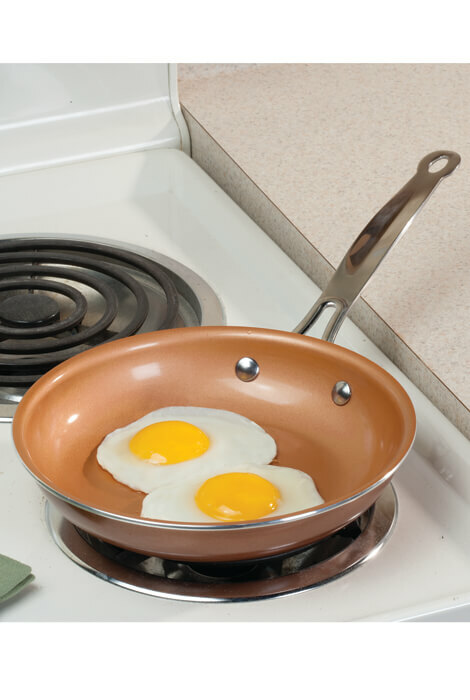 Cooking is so easy and eggs do not stick to this pan. Great for cooking small portions. These pans are great. Small pan is ideal for grilled sandwiches, eggs, etc. 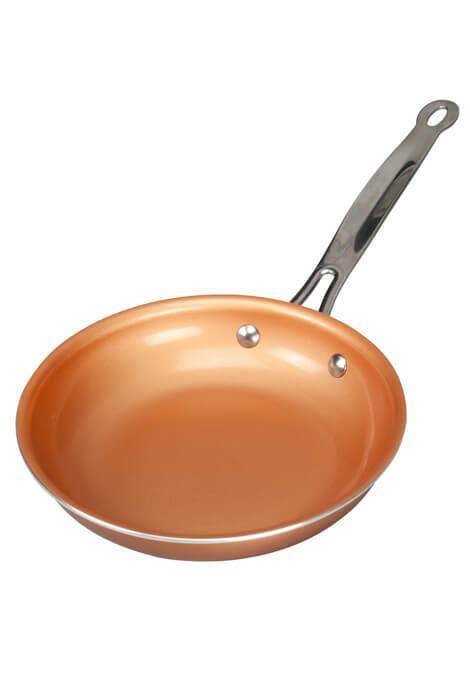 Just love this ceramic copper pan. Great size for lots of cooking tasks. Lightweight but durable, non-stick and a definite "go-to" pan for everyday. Gave this to my Mom as a present and she loves it! She says it's the perfect size for one person! I bought this pan as gift for a friend n she told me that she loves it. The description said that no oil or cooking spray is needed; which is totally not the case. All food stuck to the pan and burned. Consequently I threw the pan out since it is useless. It came in a plain carton with no manufacturer and just said made in China so I am sure that this was not true pan that I have seen advertised but just a knock off copy.